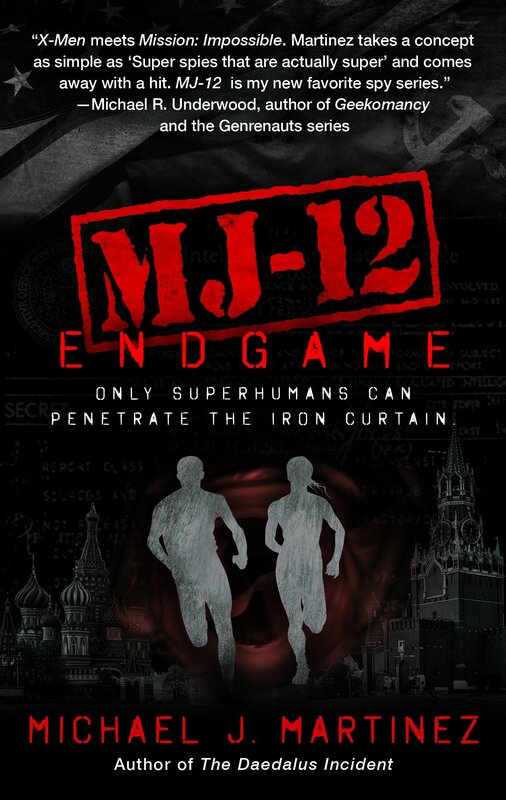 “MJ-12: Endgame” (by Michael J. Martinez) is a satisfying conclusion to the MJ-12 series. What do you do when you’ve written a stellar first book of a series and an even better second book? You write a satisfying conclusion that blows both of the previous books out of the water and delivers everything fans of the series could want! I’m pleased to report that this is exactly what Michael J. Martinez did with MJ-12: Endgame, the third and final book in the MJ-12 series. A lot of what I said in my review of the second novel, MJ-12: Shadows, applies to this third novel. To avoid repeating myself, I’d recommend you check out that review to get the gist of my thoughts. But, to summarize the gist of that previous review, I appreciate how Martinez treats his audience with the understanding that they’ll have read the previous books. He wastes little time in recapping the events of the earlier novels; instead, jumping right into the action by plunging our heroes deep into the Cold War and getting the story moving as quick as possible. Martinez continues to expertly weave the fictional aspects of his story into the real history of our world. (There’s even a nice little bit at the end of the book where he goes into some detail about how many of the events in the MJ-12 series actually happened, just without the influence of any superpowered beings). I’m a big fan of alternate history stories – or stories where the world in the novel is very similar to our own world but with slight differences – and Martinez really handles that delicate balance perfectly. It never feels like a history lesson but it also never feels like it strays too far from actual history that he loses the belief of his audience. Unlike the previous novel, Endgame is far more of a straight action novel than a mystery. Martinez has always excelled at writing action scenes and Endgame doesn’t buck that trend. However, he still has crafted a compelling plot with Endgame; it’s most definitely not just a mindless action novel. Even though there’s no huge mystery this time around, the plot is still beyond interesting. It really feels like the previous two books have been leading to this point as everything that’s happened in the series starts to boil up and overflow (timed, of course, with the death of Stalin and the rise of Beria within the USSR). Tensions between the US Government and the Majestic 12 program have never been more fraught as the inauguration of a new president has brought a new level of criticism, doubt, and fear toward the program and to Variants as a whole. Add to that the mysterious changes in the Variants’ powers, the weird phenomena being recorded from the Vortex, and whatever the heck Beria and his Variants are up to and you have a pretty strong plotline that drives the narrative forward. As always, Martinez somehow manages to juggle an array of various subplots as he splits our team into several smaller teams so they can all go on their own missions. Points of view change as we jump from team to team, ranging from North Korea, to East Germany, to Russia, and to the United States. There is so much that happens in this book that it’s surprising it’s all accomplished in a totally satisfying way within the 300 or so pages of the book. The pace never feels too fast or too slow, no characters feel like they’re not given enough time to shine nor is any plot really overlooked in favor of another (save for – maybe – the plot involving the Vortex and the intelligence behind it; I could have used a bit more time spent with that and a bit more of an explanation behind it than we got, but it wasn’t enough to really impact my experience of the book in any negative way). Not only are all of the plots well developed and well executed, but many of them are still surprising. One subplot, in particular, blew me away by the end; I had fully expected it to go one direction and it went the totally opposite direction. I was honestly so much happier that it played out the way it did (because I was not happy with the direction I thought it was going), and it just really pleased me. It’s a really well-executed story. The biggest strength of Endgame, though, is its characters. The characters have always been the best part of the Majestic 12 series. Sure, the fact that it’s a story about superpowered spies is interesting as hell, but the books simply wouldn’t work if the characters weren’t also so captivating. The stars continue to be Frank Lodge and Maggie Dubinsky. Both of them go on such complex journeys through this book (and the series as a whole, to be honest). They both straddle the edge between staying on the reservation and going off the deep end in regards to their powers and how they use them and I find that kind of thing so interesting. Morally grey characters are far more interesting to me than ones who are wholly good or wholly bad, and the Majestic 12 series is full of those kinds of characters. Every main character gets a chance to shine in this book as do a bunch of new characters. It’s really impressive how Martinez is able to have all these characters and make all of them feel like real people even if he can’t spend a whole lot of time fleshing them out. More than anything else from the MJ-12 series, I think I’ll miss spending time with these characters. All in all, MJ-12: Endgame is a super satisfying conclusion to the Majestic 12 series. It ties up all the loose elements left scattered throughout the series in a way that feels both satisfying and dramatically earned. It continues to develop the characters in ways that feel true to who they are but that also challenge their beliefs. All the main questions left hanging from previous novels are answered and, even if I would’ve liked a bit more explanation to those answers, they’re satisfying answers that feel dramatically earned and make sense within the context of the story. MJ-12: Endgame is a great novel that maintains all the great aspects of the previous books in the series while continuing to improve upon them. It’s engaging, surprising, suspenseful, action-packed, and genuinely emotional. The alternate history is handled with such care, research, and interest from Martinez that it’s easy to find yourself lost in it and start to believe it’s not fiction at all. The social commentary is a bit less strong in this book than in previous ones, but it’s still there and (unfortunately) still timely as ever. Martinez has a gift for these kinds of stories. He has a gift for creating diverse, fully formed characters with captivating backstories. He has a gift for building compelling universes that readers want to spend time in. And he has a gift for crafting interesting, well-paced narratives. His stories are able to appeal to a number of people. This is a spy novel, a superhero novel, an action/adventure novel, and a political drama. He writes for such a broad audience and the characters are so varied and diverse that it’s easy for a reader to find someone in the story they can identify with. MJ-12: Endgame is just a really good time and a really good way to end this series. ← REVIEW: Welcome to Night Vale, Episode 133 – Are You Sure?